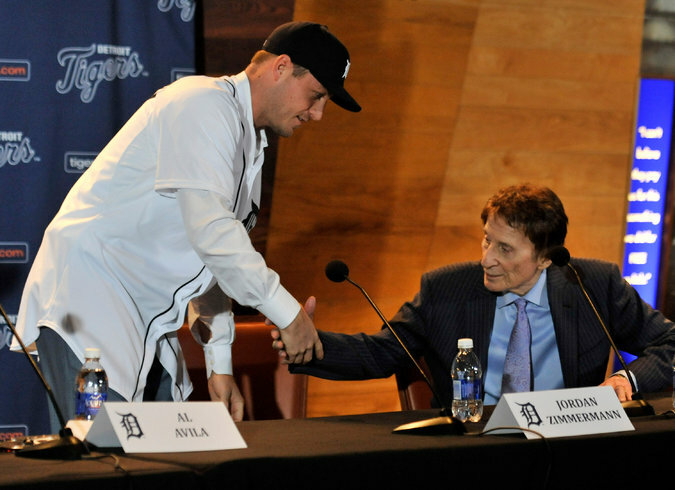 Jordan Zimmermann with the owner Mike Ilitch of the Tigers on Monday. Zimmermann, 29, signed a five-year, $110 million deal. The Opryland Resort & Convention Center in Nashville is a sprawling wonderland with rivers, waterfalls, plant life and glass ceilings that make you feel like a cast member in “The Truman Show,” a reality series that is actually just make-believe. Next week, the subject is baseball, back for an encore presentation. The winter meetings have been held many times at Opryland, including 1998, when the Los Angeles Dodgers signed Kevin Brown to baseball’s first $100 million contract. That deal made clear that owners had untold resources to lavish on players and was a sure sign that baseball economics could never be measured against any other kind.